Christina Martin, along with business partner John Strom, runs the Morningside Farms CSA in Brevard, North Carolina. CSA stands for Community Supported Agriculture; customers pay for shares at the beginning of the growing season with the agreement that the farmer will provide a box of produce for each week of the growing season. Christina produces the typical annual vegetables that are from organic seed whenever possible and grown organically, though the CSA is not certified. She has also added Asian greens, chard, kohlrabi, and radicchio. 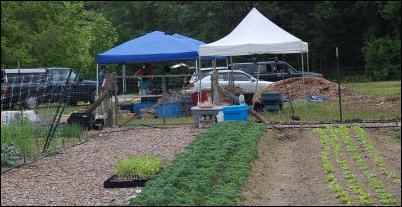 In addition, the CSA has partnered with other local farmers and businesses to provide beef, corn, pork, eggs and coffee. What experience and/or education do you have in agriculture? Christina attended the University of California, Santa Cruz where she participated in an organic farm apprenticeship at the Center for Agroecology and Sustainable Food Systems. 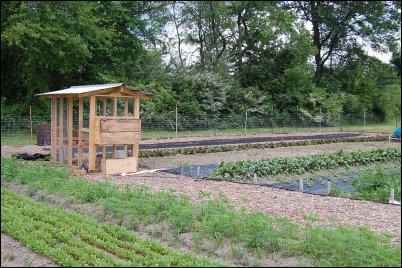 During this six month apprenticeship, students rotated through three different farming systems: raised beds or farm style, row crops for tractors and big production, and permaculture/Garden of Eden. Christina connected with the farm style and utilizes it on the CSA farm. Did you grow up farming? How did you enter this occupation? During her studies as an English Literature major and a Religion minor, Christina was fascinated by the symbolism of food, in particular, the symbolism of food and communion. She was also heavily influenced by books such as World Hunger: Twelve Myths by Frances Moore Lappe, which is about global food systems, economy, access to food, and community, Eliot Coleman’s New Organic Grower: A Master’s Manual of Tools and Techniques for the Home and Market Gardener, and The One-Straw Revolution: An Introduction to Natural Farming by Masanobu Fukuoka. 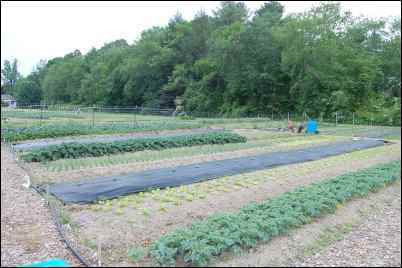 As for the founding of the Morningside Farms CSA, she simply knocked on the door of a friend-of-a-friend and proposed starting a CSA on the person’s land. She states that there are many opportunities for “landless” farmers to find land on which to grow because many people are interested in gardening or farming but don’t have the time or money to get started.w did you decide upon your product? Christina begins forming the sewing schedule during the winter and must ensure a continuous supply for twenty weeks. After filling in the slots with the traditional annual vegetables, she fills in any “lags” with lesser known vegetables. One benefit of CSAs, she feels, is that customers are more likely to experiment with new vegetables, if for nothing else than to avoid wasting food they have already paid for. One reason she adds Asian greens, in particular, is that her mother is Japanese and so she is partial to these greens. She has also found that they grow particularly well in our area. What are the greatest challenges facing your farm? In the beginning of her CSA career, Christina admits she was nervous about taking the customers’ money and being able to provide enough produce; she was concerned about having the financial responsibility in case there were farming disasters that lead to crop failures. She believes having a business partner helps in this regard as well as diversity – even if one crop fails, diversity ensures that other crops will still provide enough food. What are the greatest benefits you receive from farming? Christina enjoys the social aspect of CSAs: forming relationships around food, seeing people get excited about picking up their box of food, introducing customers to the fundamentals of their food supply. CSAs help people form a community around an ideal and they help the local economy while also eliminating the middle man. It is, Christina feels, the most rewarding way to provide food. How are things different now than when you started? What new things have you learned? On a personal level, Christina is learning more about the business part of running a CSA – how to deal with the financial responsibility such as paying out of pocket for up-front costs instead of relying on a sponsor. On the farm, she is paying more attention to the regulations such as how to handle food and when to fertilize. Her goal is to make the CSA more sustainable so that it would continue to run even if she were to step away from it and figuring out how to “close the circle” by taking steps such as introducing chickens in order to have fertilizer. When she started running a nearby CSA, she sold twelve shares. Four years later her CSA has 65 shares. She believes people are more aware of CSAs and the importance of eating locally and the greater sustainability of eating locally. What are your thoughts on America’s food supply? What are some problems? What are some good things we have going? The greatest concern she sees is organic farming turning into industrial-style farming – big farming and monocultures. She mentioned Earthbound Farms moving their farms to Mexico; what does this mean for the local economy they left behind, the Mexican workers they may be exploiting, and the integrity of the USDA organic certification? Another concern is growing and eating foods out of season. Growing seasons are dictated by natural factors and to eat outside of the seasons requires too much input to be sustainable. What do you wish the general public knew about farming? Christina would like for people to learn to eat with the seasons – when the seasons are ignored, there is a disconnect between people and nature. On the other hand, CSAs help customers tune into the local ecosystem. They also put the customers in the farmer’s shoes and the customers learn about all of the natural factors that can affect food supply (such as the devastating hail storm we recently had). What advice would you give to the next generation of farmers? Christina suggested that they “just put the seeds in the ground; they want to grow and it’s a small miracle every time”. There is much to be learned from trial and error and about the importance of food and how fundamental it is. She feels everyone should grow something just for the experience of harvesting. She also laments the fact that farmers are “low on the hero ladder” when, in reality, growing food is a noble and rewarding pursuit. David Mackey, along with his brother Taylor, runs the Edgewood Farm. They are the third generation of farmers on this land and they are helping to educate the next generation of farmers in the Mackey family. At one time the family had a dairy farm. Now, Edgewood Farm produces beef, eggs, meat goats, and pork. The beef is pasture-raised and the chickens are free-roaming. The pigs are raised in confinement but the pork is additive-free. Both the cows and the pigs are free of additives and shots and both are feed natural corn from the corn maze they grow for local entertainment. David’s grandfather and father were farmers and so he and his brother learned about agriculture as they grew up and helped with farm chores. Now they are teaching their sons and grandsons how to work the farm. David also has an undergraduate degree in Business, and two Master’s degrees – one in school Administration and one in Industrial Education. He uses these degrees as a Culinary Teacher at a local middle school where he teaches students skills such as preserving food by canning, freezing, and using a pressure cooker, how to cook from scratch, and how to compete in the state fair. The farm truly is a family business. As mentioned above, the land has been farmed for generations. David’s brother lives on the farm and David lives four miles from it. Both share farm duties while also working off the farm. Their sister was one of the first women to graduate from NC State’s poultry program and works to raise chicks for big-chain grocery stores. David moved away for awhile but he and his wife decided to return to our county and help keep the farm going. How did you decide upon your product? Over the years, he and his brother have producing different crops and have found that they enjoyed the livestock the most. They found that producing vegetables for market was too labor intensive, made less money, and they had to rely too much on the weather, the brokers, and the market (there wasn’t easy access to local markets previously). Educating the public about farming is a big challenge. He finds that, while the parents are supportive, his students usually have very little knowledge about food or agriculture. Oftentimes, the public has a negative view of farmers as dumb and ignorant, dressed in the stereotypical overalls, when really, they are some of the most intelligent people. The public also needs to learn that produce doesn’t have to be perfect, that extensive use of chemicals are usually required in order to produce perfect vegetables that are found in the grocery store. Furthermore, they need to understand the importance of locally grown food and the risks that farmers face. David enjoys growing a crop and being able to harvest it. There is satisfaction in being able to make positive changes every season in regards to watching the mothers and selecting and breeding the animals. Marketing is now more important than ever and farmers are more self-conscious about their image and the public’s perception. For instance, when he spreads manure in the fields, he’s more aware of what the neighbors might think, if they’re offended by the smell, if they don’t understand why he’s doing the things he’s doing. Marketing also involves a lot more attention to what the public wants and meeting their demands and understanding the “eating trends”. For example, many farmers have to pay closer attention to the genetics of their animals in order to produce animals with leaner meat, since that is what the current demand is for. The Mackeys are farming the way they have always farmed. They always raised the food organically because they didn’t want to eat food that was filled with and/or covered with chemicals. On the other hand, he believes that producing food for larger populations requires different practices. He states that agriculture exports are one of the largest commodities in our country and that industrial farms need to maintain large outputs (such as 200 bushels of corn per acre) in order to keep up with this demand. David gave the example of a chain restaurant that demanded that chickens weigh 4.25 pounds and so when a sampling of chickens reached that weight in the chicken house, the entire house was butchered in one fell swoop. Yet he maintains that the family farm, while it can’t compete with such large scale production, is important and fills a particular niche. In David’s opinion, one good thing is that there are still people who are willing to work 16 – 17 hour days on the farm for very little pay and that people even want to stay on the farm. Some problems we are facing is the older age of farmers [about forty percent of the farmers in this country are 55 years old or older (Bureau of Labor Statistics)], the cost of land, and the misperception that farmers will always be there. In fact, farming has become too expensive for the next generation and David feels that in a couple of generations, we may no longer be an agricultural nation. In order to cover the cost of land and to make living, farmers have to use pesticides and GMOs and there are few full-time farmers any longer. In addition, agricultural education is suffering. Local Agricultural Extension offices are being shut down and Agricultural classes in high schools are being used as a “dumping ground” for troublemakers and poorly performing students when they used to be filled with the children of farmers.